On GiveGab, an Auto-matched gift is a sponsor matched gift that your nonprofit receives automatically as an offline donation that is designed to match, or double, a gift received from a donor. Auto-matched gifts come from a pool of funds that was donated from a person or company that is intended to be used to double the amount raised by your organization. Typically, the pool of funds used to make auto-matched gifts are received as offline donations. A matching gift is only auto-matched (or matched automatically) if you have auto-matching enabled. You can learn more about how to add a match commitment here. 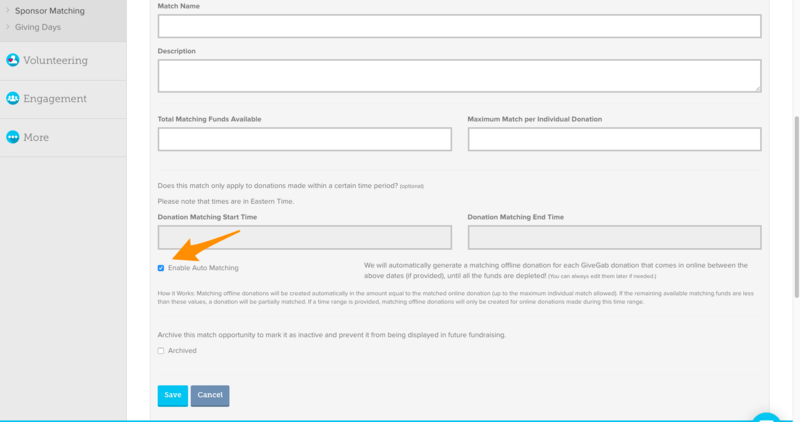 You can enable auto-matching after adding a match commitment to a campaign or event by clicking on the checkbox that says "enable automatching" under the sponsor matching editor. After auto-matching is enabled, for each donation you receive, matching funds from your sponsor organization will automatically be added to your campaign or Giving Day total as offline donations. For example, ABC Corp. donated a $5,000 1 - to - 1 match to XYZ Nonprofit. XYZ Noprofit will receive $1 from ABC Corp. for each $1 that is donated by supporters. XYZ Nonprofit can now promote this match from ABC Corp. as a chance for donors to double their impact: a $25 gift becomes a $50 gift, a $50 gift becomes $100, and so on. Note: Your nonprofit is responsible for gaining and receiving the funds for the match sponsor. GiveGab does not collect the matching funds from your sponsor on your behalf. GiveGab simply reports the amount raised.